I am excited to give one Girly Girl reader the chance to win this double product giveaway! Dermaflage is the latest product to help you fill and conceal face and body scars easily and in the comfort of your own home. 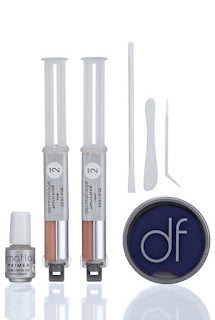 Developed by Hollywood special effects makeup artists the Demaflage Starter Kit contains everything you need to have your skin looking scar free. Be it acne scars, surgical scars or scars due to injury most of us have at least one that we would like to cover up. Dermaflage is the first at home cosmetic that easily fills, conceals and blends into your natural skin tone creating a flawless look. 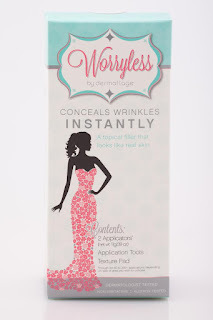 Worryless Starter Kit is the first topical filler that looks like real skin! Bye-bye Botox, hello to the only anti-frown product you will ever need. Also developed by Hollywood makeup and special effects artists this product uses medical grade silicone to simulate skin, filling in and concealing those pesky frown lines between your eyebrows. Look wrinkle free without injecting chemicals into your skin and at a fraction of the cost! Both of these products can be purchased online for $50 each but as I mentioned above, I am excited to have the opportunity to host a giveaway giving one lucky Girly Girl reader the chance to win both of these amazing products. To Enter: Leave me a comment telling me which product you are most eager to get your hands on. You can get extra entries for following GGG through GFC, Subscribing via email, liking us on Facebook and following via Twitter. I would love to get my hands o n Worryless! I'm most excited to try the Worryless Starter Kit to fill in and conceal my frown lines! I would love the Worryless Starter Kit.